How can something be both natural AND artificial? That just doesn't sound right! Well, I saw this photo on facebook and just had to 'borrow' it to do my own post and put my own spin on it! I keep advising patients and friends about the dangers of artificial sweeteners and 'not so' 'natural' flavorings and this just proves my point! Look at this photo! Read the ingredients and what do you see? All I see are chemicals!! Citric Acid, Potassium Citrate, Sodium Citrate, Aspartame (Equal), Magnesium Oxide, Maltodextrin, Natural Flavor, Acesulfame, Potassium, Soy Lecithin, Artificial Color, Yellow 5, BHA (preserves freshness). Oh, it contains soy! Citric Acid: According to numerous references, citric acid is a byproduct of citrus fruits that provide a tart flavor and is used as a flavor enhancer in many foods. However there is inadequate fruit supply to meet demand. As such, it is made from the mold Aspergillus niger in mass quantity as a byproduct of metabolism. It is used also as a preservative. A downside to this is that many people can be allergic to the mold that creates it. Potassium Citrate: As is on my soda reference, Potassium citrate is actually a drug used to keep the urine from becoming too acidic. It is used in foods to keep foods from becoming too acidic or as a preservative. It is not intended to be used in individuals with problems with swallowing, adrenal gland problems, uncontrolled diabetes, heart problems, peptic ulcers, high potassium levels, kidney problems and more. So, what's it doing in beverages? Side effects of too much potassium citrate include nausea, vomiting, diarrhea, heart problems, kidney stones, dehydration, and more. Sodium Citrate - Essentially, it is an alkalizing agent to make urine less acidic. It is used in beverages and food to give it a tart, citric flavor. Like potassium citrate, it should not be used in people with kidney problems, uncontrolled diabetes, heart problems, high potassium levels, etc. Aspartame (Equal) - There has been much controversy over Aspartame. Repeated research has been done and much more needs to be done to determine the true safety of this artificial sweetener. Several recent studies have shown this artificial sweetener to contribute to headaches, 'fogginess', brain tumors, and various other cancers. If you've noticed, there really isn't many commercials for it anymore. I wonder why? Hmmmm??? Magnesium Oxide - used as an 'anti-caking' agent in food. It is actually a drug or mineral supplement in biology/chemistry that affects every muscle, cell, nerves, bone, and the heart. Certain situations can cause you to lose too much from your body (dehydration, medications, alcohol) but too much of it can be a bad thing as well. Maltodextrin - It is a bulking agent used in food that is slightly sweet. It is a carbohydrate derived from various starches including rice, wheat, corn or potatoes. There-in lies the problem. If you have an allergy or sensitivity to it, you should not ingest maltodextrin. Natural Flavor - Again as on my post about soda, not all 'natural flavoring' can be so natural! It could potentially have close to 30 different ingredients in it (such as strawberry flavoring!). What's so natural about that? Acesulfame Potassium - You may see this on a label as Acesulfame K and it is a derivative of Aspartame - see Aspartame. Soy Lecithin (SOY!!) - Lecithin's are substances found in plants that 'emulsify' or help 'hold' things together. They are not just found in soy, but soy is so cheap to use! Lecithin's are made from the 'oils' of the plants and are generally GMO as well. However, many people can have problems with soy if they have allergies to soy. While the FDA considers soy lecithin s to be GRAS (Generally Recognized as Safe) those with severe soy allergies it can be a problem. Do you want to eat/drink GMO's? BHA - Essentially, it is a food additive that helps preserves fats. The full name is butylated hydroxyanisole. Okay, so why is this in Crystal Lite? Do you see any fats in Crystal Lite? It has been found to cause cancer in animal studies but they have not been able to replicate this in humans therefore it is 'GRAS'. I for one do not want to risk that. The recommendation is that we not consume 'more than 0.5mg per kg of body weight'. So, if you weigh 150lb, you weigh 68.2kg which would mean you can't consume more than 34.1mg of it in a day. This label doesn't even tell you how much is in this!! 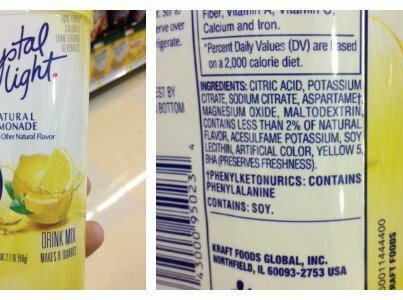 Okay, so you are drinking a product made of nothing but chemicals to make lemonade? Why not just add a little lemon juice and something like Truvia or Stevia to sweeten it? You won't have all those darn chemicals!! And, it will be all natural!! Stevia is a natural sweetener, lemon is all natural as is water!! Plus, almost zero calories naturally!! The choice is now yours! Risk cancer and chemical exposure? Or a little more effort for more natural products? Gluten Free Sweet Potato Muffins!! All Natural Plain Yellow Mustard! New Spice Blend and New Dip Mix Now Available! !